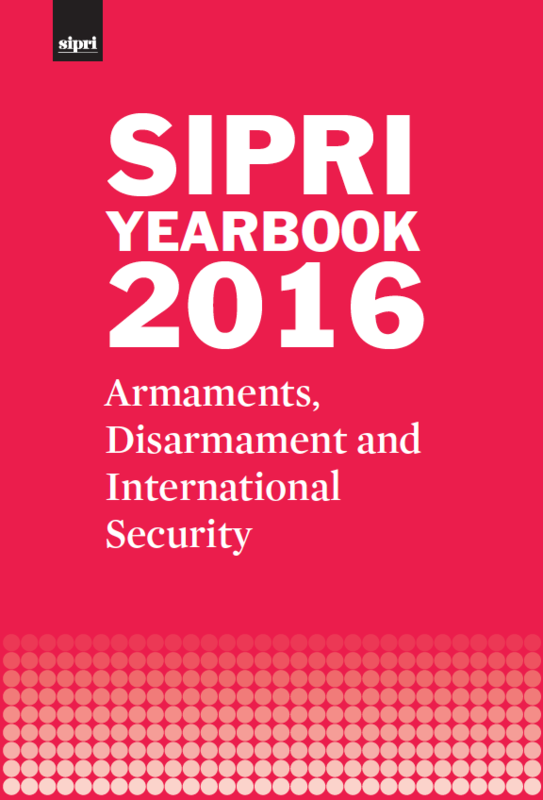 SIPRI releases its Annual Review 2016, looking back at the Institute's 50th anniversary year. It covers highlights such as the first Stockholm Security Conference on secure cities, SIPRI Yearbook 2016, data launches on military spending and arms transfers and SIPRI's explanded outreach programme. SIPRI and its partner organization CONASCIPAL launched the preliminary results of their security perception study, covering 9 of Mali's 10 regions. They are also involved in supporting the production of a Civil Society White Book for Peace and Security in Mali. SIPRI published a report examining China's engagement of North Korea through economic sanctions and how this has translated into commitments to United Nations Security Council resolutions. SIPRI and the University of Central Asia (UCA) are pleased to invite applicants to the summer school 'Social Cohesion: Concept, Implementation and Impact Evaluation' in Kyrgyzstan on 11–18 June 2017. SIPRI has launched a new series of short films called ‘Spotlight’, featuring experts and leaders from a diverse range of disciplines in the field of peace and security. The first three Spotlight films are now available on SIPRI's YouTube channel. Twenty years ago US President Bill Clinton and Russian President Boris Yeltsin met at the Helsinki Summit to discuss nuclear arms reduction and European security. Lessons about the need for inclusiveness in policymaking can be learned from their efforts. A UN conference to negotiate a 'legally binding instrument to prohibit nuclear weapons, leading towards their total elimination' began this week. This essay looks at what the different parties want. SIPRI and the Swedish Ministry for Foreign Affairs are proud to host the 2017 Stockholm Forum on Peace and Development. With the theme of ‘Sustaining peace: what works?’, the 2017 Stockholm Forum will identify good practice in peacebuilding interventions and assess how and under what conditions such approaches might be replicated, scaled or modified to meet the needs of other contexts. Contact SthlmForum@sipri.org with any enquires. SIPRI launched the report The Silk Road Economic Belt: Considering security implications and EU–China cooperation prospects with a panel discussion in Stockholm. The report provides a comprehensive review of how China’s Belt and Road initiative may affect the strategic landscape, specifically in Central and South Asia, as well as how EU policymakers should best engage with it. To celebrate the launch of the book Nuclear Multilateralism and Iran by Dr Tarja Cronberg, SIPRI Distinguished Associate Fellow, the Institute held a panel discussion on the EU's role in nuclear negotiations with Iran. SIPRI is pleased to welcome several new Associates, bringing the total number of SIPRI Distinguished Associate Fellows to eight. China’s approach to North Korea’s advances in nuclear weapons and ballistic missile technologies is frequently discussed, but its economic engagement with North Korea and its implementation of sanctions receive less attention. This report assesses the evolution of China’s engagement of North Korea and how this has translated into its commitments to United Nations Security Council resolutions. It also offers an overview of pre-existing European engagement with China on North Korea and how this can be enhanced in the future. Under the Arms Trade Treaty (ATT), states parties are obliged to establish and maintain an effective transfer control system for conventional arms and to take steps to address the diversion of conventional arms, particularly small arms and light weapons (SALW). In recent years a wide range of ATT-focused and ATT-relevant cooperation and assistance activities have been carried out with partner states in Latin America and the Caribbean with the aim of building states’ capacities in these areas. This Background Paper presents the first overview of these efforts. Popular press and more serious analysts have speculated that a complete nuclear weapon or gas centrifuge could be built using a 3D printer, detailed and accurate computer drawings, and appropriate materials. This paper examines the technical limitations of the technology and makes suggestions for how European export regimes can build up and maintain an awareness of cases where it could enable the bypassing of nuclear proliferation barriers. The post-cold war generation of citizens is forgetting nuclear weapon-related dangers and becoming indifferent to the issue. At the same time, the absence of mass grassroots, anti-nuclear protest suggests tacit support for current nuclear weapon policies. These three common diagnoses are potentially contradictory and, more importantly, are only assumptions. This paper is the first systematic attempt at assessing the attitude of the under-30s generation of European Union (EU) citizens with regard to nuclear weapons.